A graduate of the Bel-Rea Institute of Veterinary Technology in 2001. Shauna obtained experience at the Littleton Equine Medical Center in Littleton, CO. She is originally from Oregon and moved to Texas to work in the intensive care unit at Texas A&M University. She has been with Waller Equine Hospital since its opening. 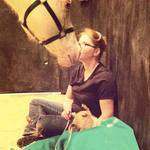 Shauna is an equine anesthetist and the practice manager of Waller Equine. Angilene is the daily technician coordinator and the inventory manager. She oversees the horses in the barn and directs the daily activity of the technicians. She is also one of two equine anesthetists in our hospital. Angilene received her training from the Tomball College Veterinary Technology Program in Tomball, TX. She completed an internship at the Waller Equine Hospital and went on to work at Tomball Veterinary Clinic. Angilene joined our staff in August 2004. She is originally from Magnolia, TX. University's Veterinary Teaching Hospital in the equine department. time, she likes to travel, draw, and spend time with family and friends. Megan graduated from Stephen F. Austin State University with a BS in Animal Science. She has had a passion for horses since she can remember and enjoys barrel racing and trail riding. Megan started working for Waller Equine in the winter of 2014 as a doctors assistant, within a very short time Megan became invaluable to the practice and has since advanced to front office manager. Sarah graduated 2012 from West Texas A & M, with a degree in Equine Industry and Business. While in school she was a member of the WTAMU English and Western teams, and Collegiate judging team. Sarah began working at the hospital the summer of 2012.
working at the hospital in August 2013. Martin Robles has been with us since the beginning of 2004. He began working on a greencard with the hopes of becoming a US citizen which he accomplished in 2009. Martin works the graveyard shift caring for the in house patients. Alexis has lived in Cypress for 11 years. She is currently in school, with the goal of getting into a vet tech program. Alexis has always had a passion for animals and has worked with small animals as well as exotic animals. She recently decided to expand her knowledge into the equine field. Alexis started with our Hospital in 2016. Lisa graduated from Tarleton State University with a BS in Animal Science as well as an Equine Certificate in May 2016. She has completed a breeding internship in 2014 at Alpha Equine Breeding Facility in Granbury Tx. In Lisa's spare time she barrel races, enjoys outdoor activities, and reading. She started working as a doctors assistant in 2016 at our hospital. Julia graduated from Tarleton State University with a Bachelors of Animal Science. She has two horses, Esther and Chance. Julia started as a doctors assistant in 2016. In the future she would like to complete a Masters program in equine nutrition. Courtney graduated in 2017 with a BS in Agricultural Business and a minor in Equine Science. She started riding horses in the 3rd grade and has been in love with them ever since. Courtney always told her parents that she would buy her own horse, but they didn't believe she would accomplish that dream so quickly. She bought her mare in October 2016 and has been in love with her since she first saw her. 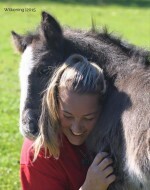 Courtney is gaining experience in equine care in hopes of running a barn for boarding and breaking horses. Kassidye is currently attending Waller High School with hopes to attend Baylor University. She was born and raised in Texas and has raised many different types of animals. She shows her two goats Django and Jimmy in FFA, and competes in wrestling at Waller High. Kassidye started working with us in 2018 in the front office and we hope she continues to grow with us throughout her high school and college career. Hunter owns three paint horses and rode with the Lonestar Cowgirls for two years. She has an interest in barrel racing and has been around horses most of her life. Prior to working at Waller Equine, she worked with a reputable Gypsy Vanner farm and she was involved in their breeding program. Her goal is to become an equine veterinarian. Hunter began working with our hospital in the spring of 2016 as a veterinary assistant. Morgan grew up with horses in her life. When she turned 16 she began riding horses for a few different ranches and working with kids in riding programs. Morgan is currently in Blinn College studying an equine science major.